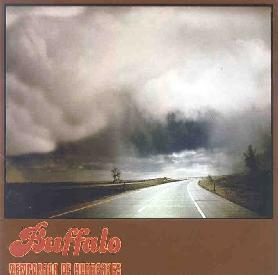 Buffalo - "Temporada de Huracanes"
The band was formed by Claudio, formerly of the band Natas (who will tour Europe for the first time in Oct-Novmber 2003). After starting and working with several different projects, he decided to go back to the roots and create some real stoner rock with 70's influences. The CD opens with a guy getting in a car and the cassette has Lovehunter by Whitesnake and then he switches to Sabbath and finally ZZ TOP and another tape has Metallica and then finally the band kicks in and the volume and sound hit you. Quite a cool way to open the CD. The sound is very thick and you can tell Claudio did not lose his love for Kyuss. The songs are mostly all sung in Spanish, which is cool. I quite like the production quality as it fits the down and dirty heavy rock grooves the band create. The band mix up the CD with small tracks of radio stuff, phone calls, a country blues tune ("Farm Song") and even an ambient piece "Y Ahora", so you are not just blasted full on for 45 minutes. The last song on the CD, "Restante", is great. It is listed at 14 minutes but ends around 8 and then around 10 the band perform an acoustic song. This is a really great experimental, psychedelic number showing a different side of the band. I was quite impressed with the CD's music and look forward to the next CD. Good stuff! The CD has a multimedia section on the end with a video from some live gigs and interviews in Spanish with English subtitles and most of the stuff from the web site as well. Very nice addition! For more information you can visit the Buffalo web site at: http://www.bffl.com.ar. Contact via snail mail c/o Manuel Platino; 621 Escondido Rd #432; Stanford, CA 94305.